Blonde in this City: Holiday Hostess Gifts-Under $50! Your immediate family, extended family, close friends, co-workers...gift buying lists can get long, fast! 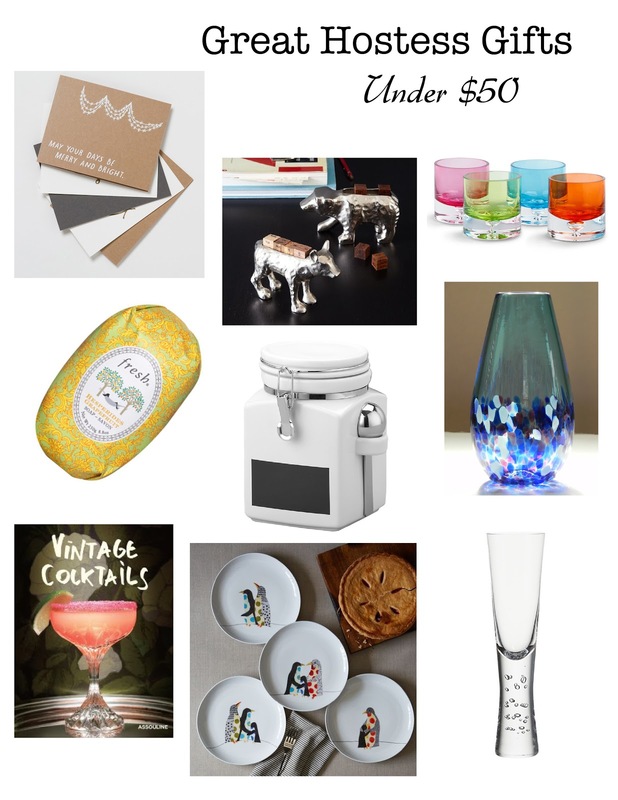 Sometimes it can be hard to find time to squeeze in a gift for your host(ess) when attending a party; these great finds are all under $50! You can never go wrong with a small home item (colored glass votives, or handblown vase, anyone?). Scented soaps are a simple & appreciated gift any time of year, and-let's take a minute to talk about those champagne flutes!! I love the solid, sturdy base, perfect for those friends with slippery fingers once they're a glass (or two!) in. The best tip I've heard this season? Keep a small basket of giftable items around (and I think this should be any time of year-not just the holidays!) and you'll have something on hand even when you're dashing out the door at the last minute. I think I'll be picking up a few of those flutes for myself-New Year's Eve party, anyone? Those chalkboard canisters are so you!